"Original NYPL Call Slip of Dorothy Seymour Mills c.1953- From Cornell Univ. Rare and Manuscript Collection"
For a researcher/historian like me, who has been writing about baseball for sixty years, it’s not unusual to get a phone call from a fan who is passionate about baseball. But the call I received from Peter Nash in 2009 surprised me. In past discussions with fans I’ve talked about topics beginning with the word “federal,” like a 1922 law case called Federal Baseball Club v. National League, in which the Supreme Court ruled that MLB was exempt from the antitrust laws. I’ve also discussed the Federal League of the World War I era, which challenged the American and National Leagues in a down-and-dirty baseball war. But I’ve never discussed the Federal Bureau of Investigation. The FBI has something to do with baseball? What could that be about? I soon learned that Peter was helping the FBI track down baseball documents stolen from the New York Public Library, where I had spent so many years researching baseball with my late husband, Dr. Harold Seymour, the first historian of baseball. Peter was asking me to recall seeing certain old documents in the 1950s and using them in the NYPL. That’s because the Library was trying to establish firmly that it was the owner of those documents, which had suddenly appeared on the auction market and were being offered at high prices to baseball collectors. The FBI was tracking those items, with Peter’s help, and wanted my assistance, too. Peter’s life, I discovered is devoted in large part to his passion for baseball. He is like the people I write about in my recently-released book about fans, called Chasing Baseball: Our Obsession with Its History, Numbers, People and Places (McFarland 2010). Peter’s obsession is demonstrated in several ways. He is not only a researcher, he is a collector. Moreover, he is a baseball entrepreneur: with others, he operates a sports bar in Boston called McGreevy’s, named for the early and famous Red Sox fan, “Nuf Ced” McGreevy. This bar is a place devoted to the Red Sox where Peter can display some of his collection of old and new pictures and objects celebrating his favorite team. 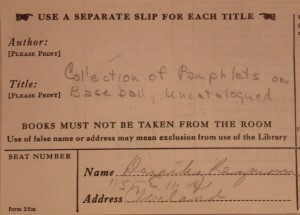 Peter’s obsession with collecting old baseball objects and documents and his delight with them became dampened when he realized that some of the letters and contracts he noticed on sale were originally part of historical collections owned by the public through their world-famous repository called the New York Public Library. Because of his collecting, Peter was assisting the security people at the NYPL on thefts of its collection when the FBI contacted him to help track down letters in the great Harry Wright Correspondence that Peter knew we had used in our research. Luckily, I recognized a quotation from a letter that a player had written to an owner—we had used it in the dissertation. That letter, which we read so long ago in the Wright Collection, had just been offered at auction! After I quoted from it, the auctioneer withdrew it from the sale. Afterwards, I received another phone call, this one from a grateful FBI agent who told me that his agency was hot on the trail of the culprits. How can a researcher like me help with this problem? In two ways. First, I could recall some of the fascinating documents I read when I became involved in baseball research, then verify my memory by checking the dissertation, especially the bibliography. I had helped Seymour prepare this manuscript for Cornell University. Second, I could direct Peter (then wearing his research hat) to the places in the Seymour Collection where he could find the original notes that I took, or that my late husband took, from these documents while we were researching our three-volume series on baseball published by Oxford University Press over the years 1960-1990. While he was locating these notes, Peter even discovered some of my original call slips written more than fifty years ago, ordering the documents from the library stacks. Dr. Harold Seymour, the first historian ever to devote his life to baseball history, solicited my help with his work starting in the year before our marriage in 1949, and I quickly became fascinated with the research and writing on the Oxford project. The New York Public Library, a great institution for scholars, became my favorite resource. So when Peter named certain documents and collections as having disappeared from the Library, I recognized several because they were so unique. And when he was trying to prove that these items were part of the Library’s collection in the 1950s, I explained where, in the Seymour Collection, our notes on these items could be found. The Carl A. Kroch Library at Cornell University, in Ithaca, New York, houses the collection called the Harold and Dorothy Seymour Papers, which includes not only the library of books and other items we had amassed by 1992, the year of Seymour’s passing, but also all the notes taken for our own books, notes I had filed in boxes carefully by topic, so that they could be retrieved if necessary. Peter made more than one trip to Ithaca to search for, and find, the notes he needed, with the help of Dr. Elaine Engst, the archivist. And he reported that the evidence he discovered was helping the FBI agent in his work. That gave me great satisfaction, for now I realized that the Collection could not only be of help to researchers/writers like Steve Gietscher and Jean Ardell, it could assist a government agency in tracking down evidence that might catch thieves. I was gratified when the New York Times credited me with furthering the FBI investigation into the theft and the fraudulent auctioning of rare baseball items. When a local Naples weekly published an article written by Phil Jason about this story, it headed the piece “FBI Scores with Help from Naples Writer.” The story was accompanied by a picture of me seated at my computer, grinning with pleasure. I soon learned from Peter that other libraries and repositories, like the Baseball Hall of Fame and Museum in Cooperstown, New York, had suffered from robbers as well, and I heard that he was helping them recover their lost holdings while the FBI was working on finding the culprits. All this shows me that passionate devotion to baseball and its artifacts can go too far. Those who become completely obsessed with the objects of their affection will sometimes go to such lengths to obtain them that they actually commit crimes. Such collectors are aided by auctioneers who neglect to verify the provenance of the items they offer for sale. The indiscretions of these collectors and auction houses result in robbing us citizens of our history, for how can we put together the story of what was happening if there are holes in the materials needed to tell that story? Besides, just viewing these documents signed by the important early movers and shakers of our National Game can be thrilling. We should not be deprived of that experience by those who have permitted their obsession to override their ethics. 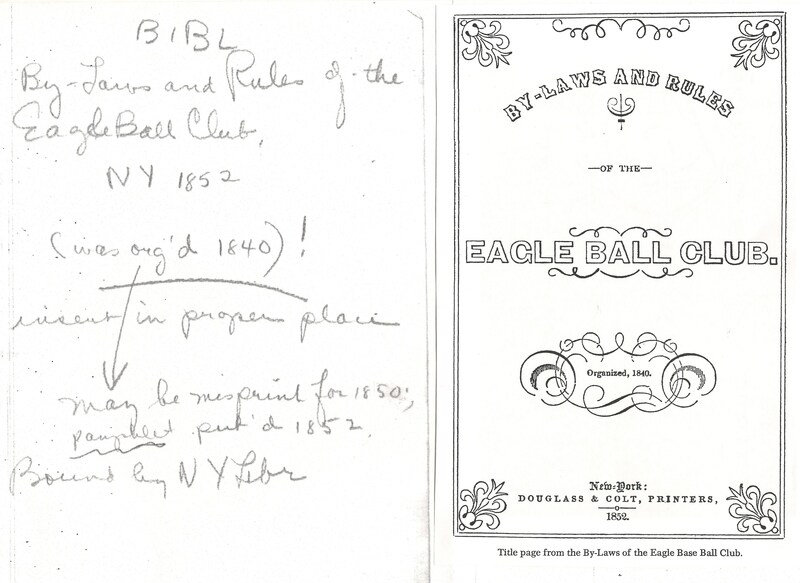 "(Left) c. 1953 Handwritten Notes of Dorothy Seymour Mills document the NYPL's 1852 copy of the Eagle Ball Club's By-Laws (Right). 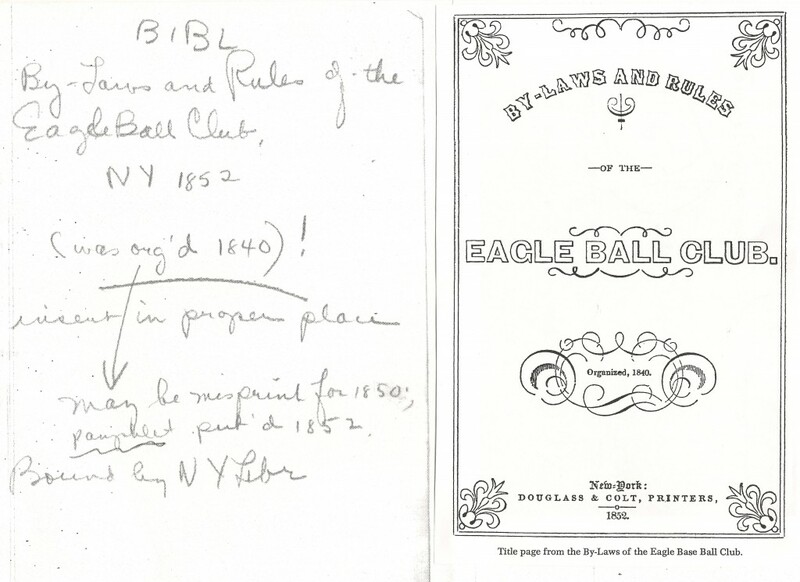 The Eagle pamphlet, one of the most important baseball artifacts in existence, was stolen from the library sometime after Mills documented it in her notes. 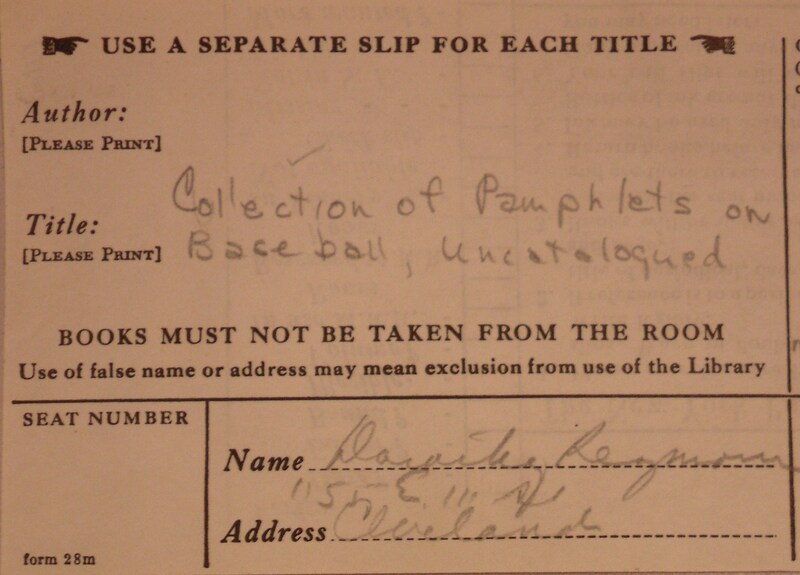 The rare pamphlet was recently recovered by the NYPL and returned to the A. G. Spalding Baseball Collection." Another terriffic story by Dorothy Seymour Mills. Her dedication to the history of sport never ceases to amaze me. Excellent article. It’s good work you’re doing, Peter. As a writer and collector of baseball memorabilia as it relates to the American Association Milwaukee Brewers 1902-1952, I know the importance of the material held in trust by our museums, libraries and private collections. I am glad to see that law enforcement is taking on an active roll in the protection of that legacy and putting pressure on auction houses to be more alert as to what they sell. Hopefully we will see more of it. We have a rich history that needs to be preserved and protected. Kudos to Dorothy Seymour Mills for sharing this.